Will there be a Super Bloom this year? 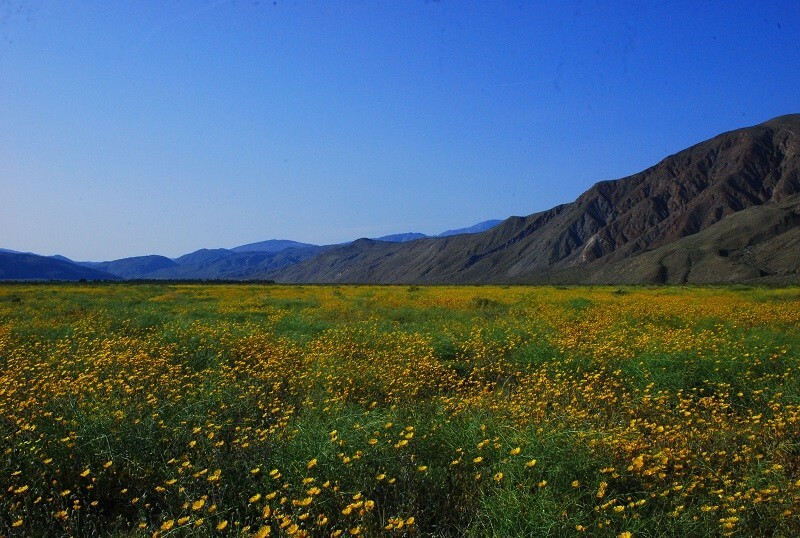 We’ve all heard the phrase “April showers bring May flowers” - But in Borrego Springs, November and December showers are essential to create a gorgeous bloom that paints the desert floor from February to March. The Anza Borrego Desert is known for its spectacular spring wildflower displays, but these gorgeous blooms typically occur only once or twice in a decade! The last Super Bloom was in the spring of 2017, and even though a bloom of that magnitude is usually only triggered every five to ten years, it is looking like we are on track to have another abundant bloom this spring! Desert research botanist Kate Harper has been making field observations over the past weeks and has stated that, barring multiple days of below freezing or extremely hot temperatures, we are on track for a “Bursting-with-Blooms” spring in Anza Borrego Desert State Park! So why are we expected to have a Super Bloom this year when we had one a mere two years ago? Several necessary conditions have colluded in order to create this gorgeous phenomenon. A Super Bloom requires well-spaced rainfall throughout the fall and winter, sufficient warmth in the spring, and a lack of drying winds. Autumn rainfall of around half an inch is needed to wash the protective coating off the wildflower seeds, which allows them to sprout. Afterward, rainstorms must continue in evenly spaced intervals throughout the winter to nourish the seeds that will eventually become flowers when exposed to the warm temperatures of February and March. Some desert wildflowers are able to bloom every year, but the flowers that bloom during a Super Bloom sprout from seeds buried in the desert sands for five, ten, or even thirty years that have responded to the wetter than average conditions. Most of the extravagant flowers in the desert are called ephemerals, due to their short lifespans. Rather than struggle for life against the desert’s extreme temperatures, the wildflower seeds lie dormant until they receive enough rainfall to quickly sprout, grow, bloom and revert to seeds again before the heat returns. If current weather patterns continue as expected, come March the typically bare desert floor will come alive with a sea of vibrant greenery, poppies, primroses, and lilies. Need a vacation now? Although the desert floor is not yet painted with flowers, there are several areas that are already in bloom! Come stay with us today and check out the Borrego Badlands to see primrose, verbena, brown eyed primrose, and other species already in bloom!